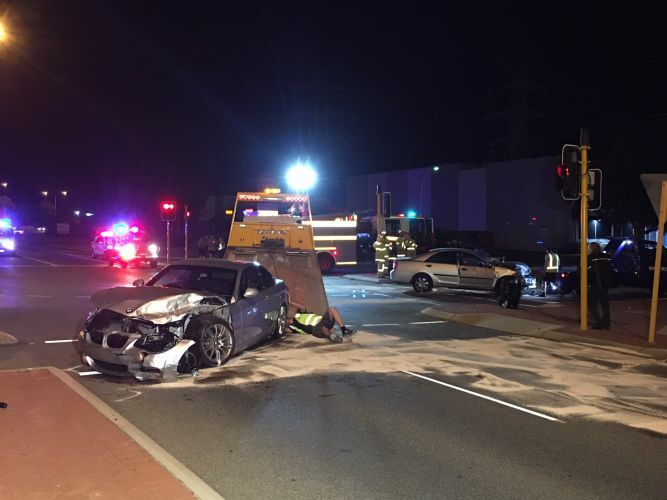 POLICE are investigating a two-car crash at a Malaga intersection last night that injured six people – including a three-year-old boy. The crash happened at at the intersection of Marshall Road and Bellefin Drive last night just after 7pm. Six people, including the toddler, were injured in the crash involving a silver 2003 Toyota Camry and a silver 2012 BMW E90 convertible. The male driver of the Toyota, as well as three adult passengers, were taken to Royal Perth Hospital. The female driver of the BMW was also taken to Royal Perth Hospital. The toddler, who was also travelling in the Toyota, was taken to Princess Margaret Hospital. None of the injuries are understood to be life-threatening. Anyone who witnessed the crash, or the two vehicles prior to the incident should call Crime Stoppers on 1800 333 000 or make a report online.